3. We should have dns management for configure A and MX Records. If you also bought hosting on your domain provider, usually you can manage dns on cPanel or something else. If you bought a domain only, you could using Free DNS management from Hurricane up to 50 domain and configure your domain nameserver to refer to Nameserver of Hurricane. After configure A Records on cPanel, go to home and select MX Entry. If you have been saw existing MX records using 0 (zero) priority, change it to 50 or 20 (or you can remove it if not needed). 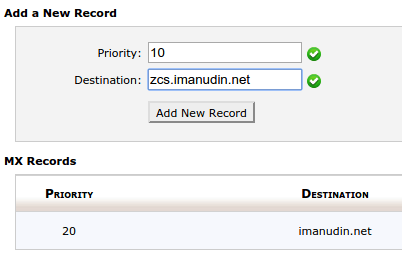 Add MX records to refer to the name zcs.imanudin.net who has been configured formerly and give 10 priority. 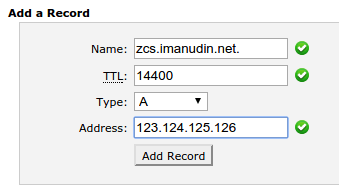 After adding MX records, please check for dns propagation at this link : https://www.whatsmydns.net/ whether the new MX records for domain imanudin.net has been known in the internet or still propagate. After above configuration has been configured, you should be able to receive emails from internet/outside. In my network i am having 2 ISP’s. As of now i configured everything in network 1 and i would like to do whenever the network 1 is goes down network 2 should live. Please help me on this. I install zimbra 8.6 on centos 7. My mail was sending /receiving even on outside network (internet) but i cant send to other domain without smtp relay.. do I really need to have it? How can I send to other domain using my own MTA(without relay)? Thanks.. I have a problem to send email outside sir everytime i send a email to other domain i receive undelivered mail returned to sender. but i try to send email to gmail.com and yahoo this is already receive my email..
here is the error sir iman. Service unavailable, Client host [213.92.211.116] blocked using Spamhaus. How can i protect my public ip to this spamhaus. i have problem. I followed the procedures of installation. sending mail to other success, but can’t receive from other mail server. I Use static Public IP, Open port 25, Nothing firewall for port 25. Mx Record and PTR record, public IP not blocked. Did you have been try to telnet or something else to make sure port 25 have been opened? how can I protect my public ip so it wont be in the blacklisted? Our public IP was blacklisted so i cant send and recieve to other domain ex: gmail.com.